That's me on the left and Gary Garren on the right. And, yes, Gary's riding a Honda 90! Gary Garren has a Honda 90. Yep, remember those? And he’s a pretty doggoned good rider, too! I thought my bike was small, but Gary sure has me beat! We had a great time today riding the Aspen and Buck trails atop the Uncompahgre Plateau outside Montrose, Colorado. This next picture gives you a better idea what the Honda 90 looks like (yes, I realize it’s older than my kids). Gary has it running well and was able to follow me through both the trails. That's the venerable Honda 90 on the left. Pay no attention to the man on the right. Photo taken by Gary Garren at the southernmost point of the Aspen Trail. Aspen and Buck Trails—note that we only traveled the portion of Buck Trail north of CR 90. The base map says that the road (also FR 540) is SR 90, meaning State Route—that's not accurate—at this point it's a county road. The location is reached by traveling west from Montrose on Colorado State Hwy 90. After awhile this paved road becomes an excellently maintained gravel road, where it also becomes Montrose County Road 90. Our parking place is at approximately N38° 19.02′ by W108° 9.35′. Note that the roads in dull orange are well-graveled and well-maintained roads accessible by any vehicle. The red lines are the GPS tracks and are single tracks, meaning only motorcycles, horses, bicycles (I actually saw one today), and hikers (we saw several of them). The red track south of our parking place is 10 miles long and took us about 2 hours (we stopped a lot). The Aspen Trail Loop itself is 5 miles long (there’s a one-mile-long yellow line on the map for scale). The Aspen Trail is mostly level and except for a few spots where there’s some erosion, is pretty straightforward. After lunch we took the Buck Trail, starting at the end closest to our parking place. I’ve only been on this trail once before (5 Jul 2010, see here). I mentioned in my post last year that I thought Buck Trail wasn’t really a beginner’s trail. I stand by that assertion today. 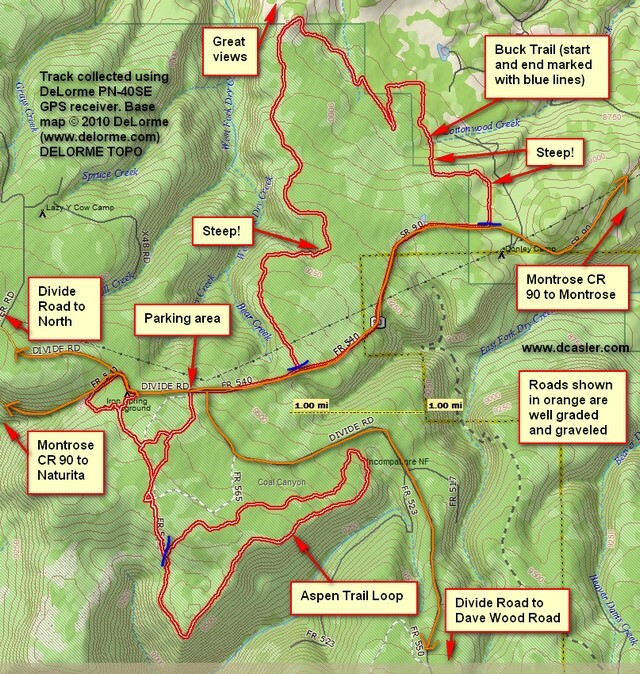 The trail is 7.3 miles long and has a couple steep sections. The stretch on the east end is particularly nasty—the trail winds through trees and has over time eroded such that it sort of steps up from tree root to tree root, and some of the steps are pretty large. I just gunned it and made it up most of the way. Twice my bike stalled—I was grateful for electric start so that I didn’t have to try to kickstart the bike at a precarious angle! Gary had some troubles with the Honda 90 on this section, but it gears way down so he was able to follow me, albeit at a bit slower pace. We took one hour and 45 minutes to cover the distance—I’ll let you do the math for our average speed. Much of Buck Trail is actually very nice and easy to travel. And, the view to the north and east from the northernmost tip of the trail is pretty spectacular. Below is what looks like a really skinny photo. If you click on the photo, you’ll be taken to a much larger version, which will appear in your web browser by itself. Click on the photo again, which tells your browser to show the picture full size—you can use your scroll controls to see it all. Use your browser’s Back button to return. The photo covers about a 120-degree panorama from somewhat west of North to somewhat south of East. 120-degree panorama, taken from "The Knob" at the northern apex of Buck Trail. Click on the image to see a larger version. Gary’s a great guy and I’m looking forward to our next ride together. 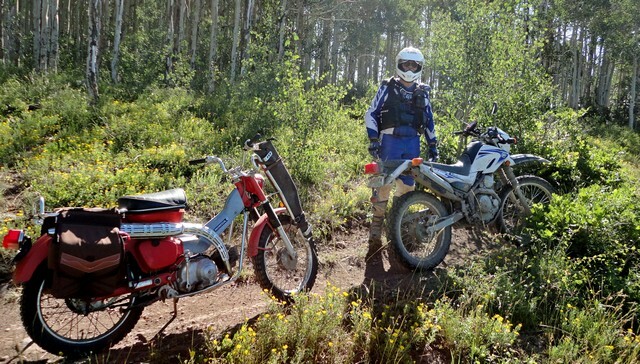 This entry was posted in GPS Tracks, Montrose County, Motorcycling and tagged Aspen Trail, Buck Trail, uncompahgre plateau. Bookmark the permalink.